We visited Ireland to meet up with a few friends we had met many years ago in South Africa and Saudi Arabia, taking us to Waterford on the Irish south coast and Londonderry in Northern Ireland. 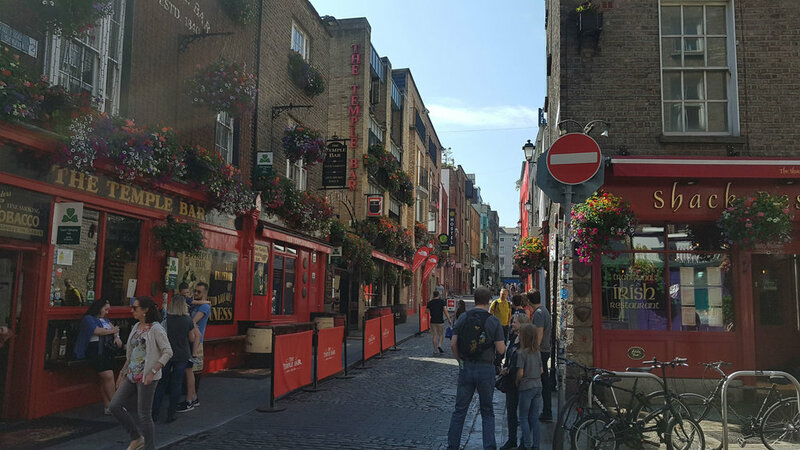 Francien and I started our journey in Dublin and immediately the houses and the roads looked very much similar to what we have seen on many of our visits to England: narrow houses, pubs serving Guinness, most dimly lit, some Victorian style, others painted in lively colours. There was no shortish of historic Churches and Cathedrals. We saw children, wearing traditional school uniforms (trousers/skirts, jumpers and neckties with the school crest imprinted), waiting for the double decker buses to take them home. Our hotel had plush floors, squeaking corridors, narrow steep stairs impossible to carry our luggage up. The river Likkey and Temple Bar old town centre are indeed the tourist attractions this city is famous for. Much to our surprise we did not see many Asian tourists, no selfie-stick wielding hordes of people taking pictures of themselves in front of no doubt beautiful landmarks such as Trinity College and Dublin Castle. Instead, many European and American tourists. The latter are drawn to this country in search of their ‘roots’, as many Irish emigrated to the USA. Visiting the EPIC Irish emigration museum on the banks of the river was an interesting experience for us as we recognized so much, being migrants ourselves: footlockers the people packed all their belongings in, airplanes and ships taking them to faraway places, the many places the migrants arrived and indeed we had seen ourselves: New Zealand, Ellis Island in New York, Boston, Australia and South Africa. 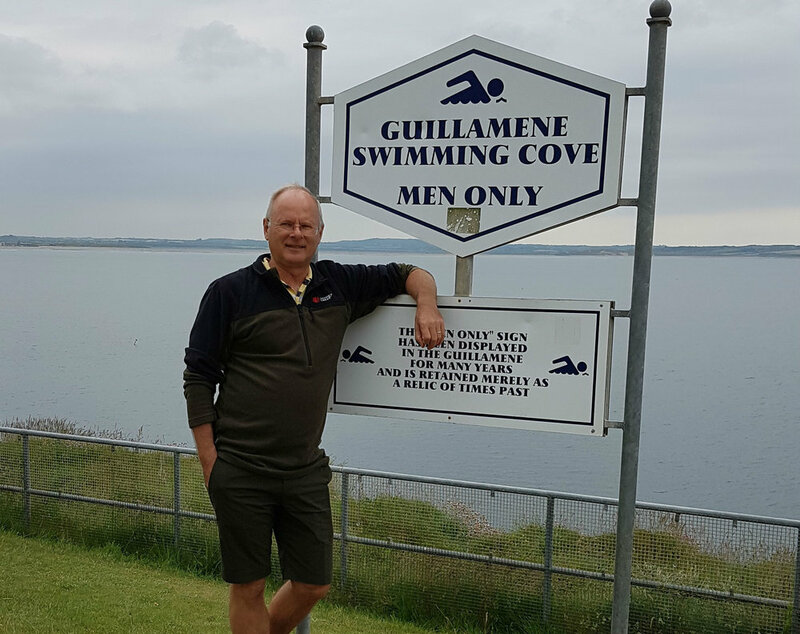 37 years ago in Johannesburg, I shared an office with a colleague, who now lives in the Waterford area on the South Coast. We never had any contact ever since, but it was great to meet up. We shared our storeys about living in different countries, pursuing international careers, raising children, tracing common friends and finding one’s own roots. We drank beer in the Ritz Pub and enjoyed dinner in the next-door Pier cafe. Francien and I stayed in a B&B in the coastal town of Tramore and before we started our journey to Northern Ireland, we walked the granite cliffs jutting into the Atlantic Ocean. The cliffs were 30 meters high and covered with grass. On one of the cliffs there were three twenty-meter-high white pillars and on top of one stood a ‘Metal Man’, since 1824 warning mariners of the dangerous Tramore Bay. Meeting up with Jim and Linda after 37 years! In the old days they had separate beaches for males and females in Tramore!! The roads to the North were quiet, windy and narrow, lined with hedges and stone walls. We stayed in B&B's in rustic houses and the people made us feel welcome. The landscape indeed was green! Sometimes bare as in Scotland, but mostly like England; windswept hills, meadows with cows and sheep, small greyish villages built around historic parish churches. We stopped at the Glendalough monastery. It was built in 600 AD by St. Kevin, being one of the earliest Christian settlements in Ireland. It has a 900-year-old stone bel-tower standing 30-meters-high. On this monastic site we strolled through the remains of stone churches, priest houses and gateways, on the banks of a mysterious looking dark lake. It all gave me a spooky feeling. Its cemetery with grey stone Kell crosses was in a valley clad with old lead mines. On the surrounding hills we saw the spoils of those 19th century mines. When we crossed the border into Northern Ireland, we saw no signs of a border. 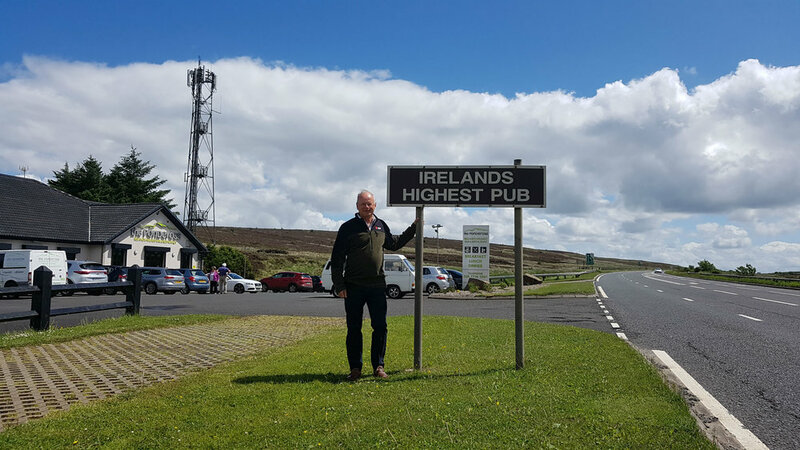 In fact, it was difficult for us to determine whether we were in Ireland or Northern Ireland until we noticed road signs with distances and speed limits all indicated in miles: we were in the United Kingdom. In the cathedral in Enniskillen, a town on the banks of Lough Erne, a man explained the meaning of some ornaments inside the regimental chapel of the church, built in 1620 during the Plantation period when many Scots were moved here by the English. There were many war memorials, plaques, flags, name lists, similar to inside all those other English churches we have seen around the world. In the same town we walked past a cenotaph, commemorating an IRA bomb attack in 1987 which killed eleven people. This was the first visible sign we saw of the civil war which took place between the Catholic Republicans and Protestant Unionists and ended in a peace treaty in 1998. But is wasn’t the last one. The coastline of Northern Ireland is characterised by green headlands, jutting into the white capped ocean. We drove pasted medieval castles, some barely ruins left, a few converted to hotels. Again we saw many churches in the villages. A visit to the Bushmill distillery, since 1608 the oldest still operating in the world, was not only a journey back in time, but certainly a lesson for us how to enjoy real good Irish whiskey. We spent a few days just outside Londonderry (or Derry is the Republicans call it), a city famous for its completely intact 17th century walled centre. Despite the typical Irish summer weather (rain and windy), we walked across the stone wall, 1.5 km in circumference, eight meters high and up to ten meters wide. We enjoyed the sights of the Peace bridge and Guild house. From high above the city we saw one neighbourhood draped in Union Jack flags, murals depicting political statements supporting the United Kingdom and curb stones painted in red-white-blue colours. And then it was impossible not to see the loyalty of another neighbourhood called Bogside, just a few hundred meters away. 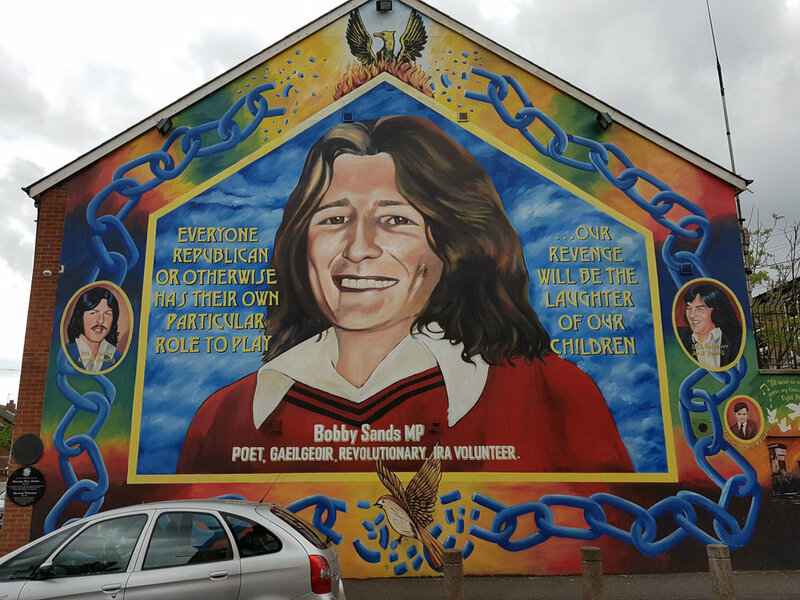 We saw Irish flags on all streets corners and nationalist murals, colourfully painted on some house facades, telling stories about their fight for freedom. Our last stop in Northern Ireland was its capital Belfast. Unfortunately, this city is known for its violent past during the recent civil war (what the locals euphemistically call ‘The Troubles’). So Francien and I visited the places in the western parts of the city which were in particular hard hit during those days. We were not prepared for what we saw! Two local guides (both convicted catholic/protestant fighters, now community workers) told us what has happened here and showed us how people are still coping with that. 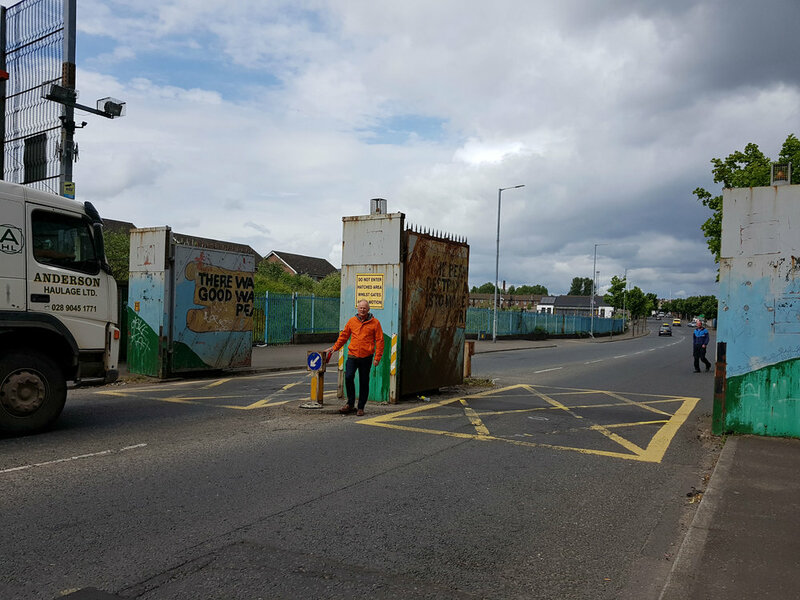 We walked on both sides of the ‘Peace Wall’, separating Catholic from Protestant working class neighbourhoods. On the protestant Shankill Road side, Union Jack flags hang from houses and poles on the street. Ropes tied across the main street proudly displayed flags with the British colours. On many street corners memorials of murdered people and murals depicting the support for the Union. This cynically called ‘Peace Wall’ is five kilometre long, ten meters high, at the base one meter thick and has steel gates which close every day between 7 pm and 7 am. At night these neighbourhoods are completely separated from each other: nobody in and nobody out! “What would happen if the police did not close those gates at night?” I asked John, one of our guides. “The people living here cannot forget nor forgive all the terror they have suffered. They are still afraid of the people on the other side and would not accept that. It would give the radicals an opportunity to start the violence again.” he insisted. Then we walked through such a gate onto the Falls Road side. Here we saw hundreds of Irish flags, but also Palestinian flags and images of Spain’s Basque country, symbolizing the struggle of people for their land. 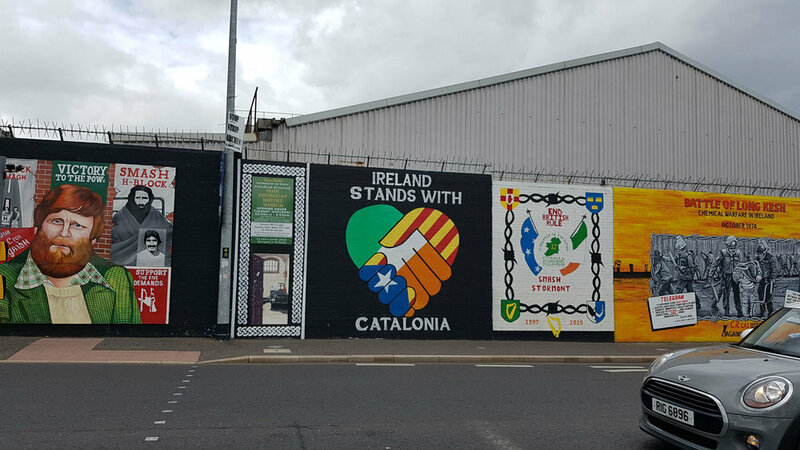 We saw memorials and murals still glorifying the fallen IRA terrorists.In the media this conflict is painted as a sectarian fight between Protestants and Catholics, but it’s really all about politics. It’s about whether Northern Ireland should be a part of the United Kingdom or a part of the Republic of Ireland. People on both sides of this Wall were still afraid of bombs even after twenty years peace. Their children go to separate schools and play in segregated parks. They all want to maintain this status of self-segregation. Francien and I had a depressing feeling to see so much distrust and hatred. Déjàvu. This wall is hardly any different from the Berlin Wall we have seen and experienced in 1984. We all know what happened with the Berlin Wall, so let’s be hopeful for Northern Ireland. This was a quirky site of Ireland, a beautiful country with great people. We left with some fond memories, but certainly also better appreciating the suffering which took place only very recently in the middle of Europe!